University of Saskatchewan researchers have discovered the chemical pathway that Cannabis sativa uses to create bioactive compounds called cannabinoids, paving the way for the development of marijuana varieties to produce pharmaceuticals or cannabinoid-free industrial hemp. The research appears online in the July 16 early edition of the Proceedings of the National Academy of Sciences (PNAS). U of S adjunct professor of biology Jon Page explains that the pathway is an unusual one, involving a specialized version of one enzyme, called hexanoyl-CoA synthetase, and another enzyme, called olivetolic acid cyclase (OAC), that has never before been seen in plants. "What cannabis has done is take a rare fatty acid with a simple, six-carbon chain and use it as a building block to make something chemically complex and pharmacologically active," Page says. Page led the research with PhD student Steve Gagne, who discovered OAC, and postdoctoral researcher Jake Stout, who discovered hexanoyl-CoA synthetase (reported earlier this year in The Plant Journal). Cannabis has been cultivated for thousands of years for food, fibre, medicine and as a psychoactive drug. 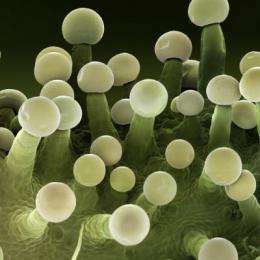 Cannabinoids such as delta-9-tetrahydrocannabinol, or THC, are produced on the flowers of the female plant in tiny hair-like structures called trichomes, the plant's own "chemical factories." The researchers used genomic analysis of isolated trichome cells to produce a catalog of the genes involved in cannabinoid production. Page and his colleagues have already used the new enzymes to coax yeast to produce olivetolic acid, a key metabolic intermediate on the biochemical pathway that leads to cannabinoids. "Now that we know the pathway, we could develop ways to produce cannabinoids with yeast or other microorganisms, which could be a valuable alternative to chemical synthesis for producing cannabinoids for the pharmaceutical industry," Page says. There are more than 100 known cannabinoids, only a few of which have been explored for their possible medicinal uses. THC is the main psychoactive cannabinoid, responsible for the "high" sought by recreational users, as well as medicinal effects such as pain relief, nausea suppression and appetite stimulation. More than 19,000 patients in Canada are authorized to legally use marijuana to benefit from these effects, and many others use cannabinoid-containing drugs via prescription. Another important cannabinoid, cannabidiol (CBD) has anti-anxiety and neuro-protective properties. Page explains that knowledge of the cannabinoid-making pathway could also make matters easier for Canadian farmers. Plant breeders can now look for cannabis strains that lack key parts of the cannabinoid-making pathway, which would allow for zero-THC varieties (current Canadian regulations call for no more than 0.3 per cent THC for industrial hemp, compared to 15 per cent or higher in the more potent marijuana varieties). Although hemp cultivation in Canada dates back to the 1600s in Quebec, today industrial hemp is a niche crop, grown mostly on the Prairies. Its popularity fluctuates considerably, with about 15,700 hectares (39,000 acres) grown in 2011 according to statistics from Health Canada, which regulates the crop. While hemp is well-known as a fibre crop for everything from textiles, rope and paper, it is more often grown in Canada for its seed. Hemp seed, which is high in omega-3 and omega-6 fatty acids, is marketed for its healthy qualities. It is used in everything from lactose-free hemp milk, breakfast cereals, snack foods and protein supplements for athletes. Hemp oil is also used in cosmetic skin care products. Hemp as a fiber crop is not exactly optimal because of how much of the plant is not the desired kind of fiber, and the difficulty of processing it. That's why it was surpassed by other sources of fiber like manila hemp (Abacá) which had superior properties, until the introduction of synthetic fibers. Just about the only things that are made out of hemp fiber these days - on the large scale - are bibles and cigarette wraps. It tickles me to know that the United States Constitution is written on hemp paper. The fact of the excellent condition of the document today attests to the wisdom of the choice of material to entrust our founding documents to. eikka , everything of the plant can be used something. just because it doesnt contain as much fibre as other plants would does not mean it is less optimal, very far from that it is an easy plant to grow for anyone. Anyone could start a local bussiness producing clothes or paper. selling the left overs or reusing them. @Arigod: the US constitution was drafted on hemp paper, but the final copies were on parchment (animal skin). @Eikka: the hemp decorticator was invented in 1917. It did for hemp fiber what the cotton gin did for that crop: took most of the labor out. The Harrison Tax Act of 1917 was passed to keep it from competing with wood pulp for paper and cotton for fiber. Blue jeans were made from sailcloth (fabrique de Nimes, aka denim) which was hemp, until the law interfered. Nimes, France was a big sailmaking town then. Claude Levi-Strauss got lots of sails cheap from the abandoned ships in SanFrancisco bay during the gold rush. Yup, constitution written on hemp paper is a myth. It is written on parchment (treated animal skin). How many pro hemp are animal rights activists and would be appalled to learn that! Or hemp-free industrial cannabinoids. Just saying. If cannabis is easy to grow, why not go an extra step: Make it produce other pharmaceutically valuable substances? Until now, most GM pharma production has ben using bacteria aor yeast but a few months ago there was a breaktrough in modifying plants for such purposes. We already have cannabinoid free hemp. And it doesn't faze our drug-frenzied politicians. Which proves an old saying, marijuana causes insanity, but only in non-users. The main purpose of this research is to allow the creation of patented genetically modified cannabis and pharmaceuticals. Regular varieties might be just as good or better, but the exclusivity of patents and the concentration of monetary interests they create makes it politically far more feasible to create exceptions in the law than it would be if the the parties at interest were just the usual hippies. lets see what they can develop from this discovery. At least in Canada they can conduct this medically valuable research. Can you imagine if researchers could control the THC/CBD ratios? That would be a great step for medicine. I could see genetically engineered spiralina algae with optimal cannibinoid ratios as being good medicine. I don't understand why research dollars are being spent on cannibinoid free hemp crops. You can't really smoke it anyways, just grow it, already! like our ancestors have for thousands of years. Hemp seed oil has a lot of potential as an alternative fuel source. And finally, there are only 19,000 med mj patients in Canada? Wow. I live in California and there are probably at least that many in a thirty mile radius from where I live.